If you discover that you’re expecting twins or you’re adding another child to your family, it’s a wonderful, exciting time. But your delight can be tempered by the knowledge that you’ll now need to buy two of everything. Unfortunately, that can be financially devastating if you make a wrong decision. One thing you will need is a double stroller. If your eldest child is under four, a double stroller will make your life much easier. 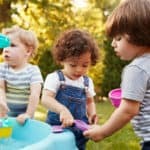 But what kind of double stroller should you buy? The choice is a simple one on the face of it; you can opt for either a side-by-side stroller where the passengers ride next to each other or a tandem stroller, where one child sits in front of the other. Each style has pros and cons. So, until you understand the benefits and features of each, you won’t be in a position to make an informed decision. 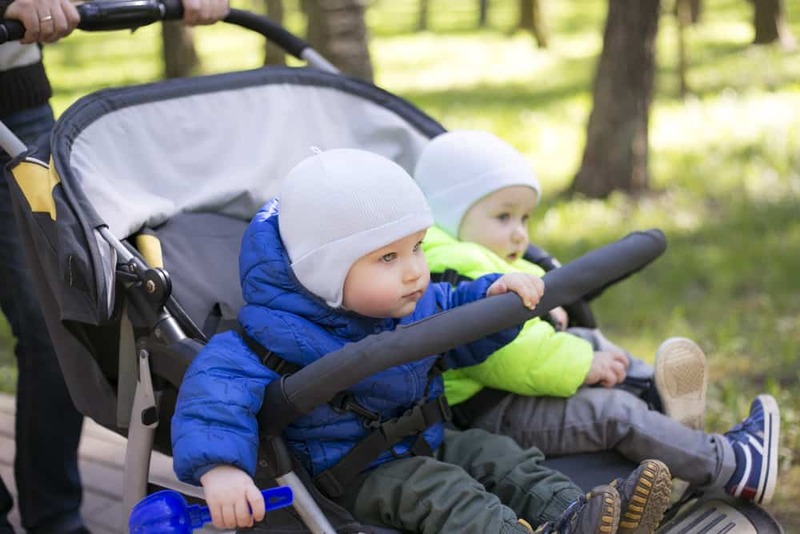 In this article, we look at both styles of double strollers. So, you can quickly see which option would be the best for you and your growing family. 1 What do you want the stroller to do? What do you want the stroller to do? Much like a family car, the stroller you pick needs to fit your lifestyle. And, there are double strollers to suit pretty much every requirement and situation. Regular double strollers are designed to be used for shopping trips, visits to the park, and general travel around town. These designs are usually equipped with generously proportioned shopping baskets. Additionally, they typically include pouches for items such as your cell phone, keys, and baby essentials. Double umbrella strollers are super-lightweight, easy to carry, and are designed for families who like to travel light. An umbrella stroller can be folded up and carried over your shoulder or by your side, just like a large umbrella. An umbrella stroller makes for easy storage and fits neatly into your car trunk without taking up too much space. If you enjoy running or jogging and you want to take your children with you, you’ll need to get yourself a double jogging stroller. Jogging strollers are typically built with inflatable rubber tires and sophisticated suspension systems. These features make the ride super-smooth and the push easy. Many joggers can be used as regular strollers too. Double all-terrain strollers are designed for taking off-road. If you love hiking along rough trails or spending days trekking along summery beaches or wintery parks, you’ll need an all-terrain stroller. Like jogging strollers, all-terrain models have rubber inflatable tires and suspension systems to cope with bumpy, rough terrain. All-terrain strollers and joggers have three or four wheels. The wheels’ design allows them to swivel in front or be locked when moving across uneven surfaces to improve stability. Double sit-and-stand strollers are perfect if you have a toddler and a new baby. The older child can enjoy the independence of being able to get out of the stroller. They can walk or stand, or sit and ride when their legs need a rest. The baby younger child can ride comfortably in the rear seat of the stroller. Hopefully, now you have an idea of the type of double stroller that you want. So, let’s take a look at some of the main features of the tandem and side-by-side styles of stroller that you’ll need to take into consideration. The main difference between side-by-side and tandem strollers is their width. The tandem stroller is typically the same width as a single stroller. So, they generally measure in at around 41.5” H x 21.5” W x 37” L.
It’s useful to know that many convertible double models can accommodate child car seats too. The width of a tandem stroller makes it easier to navigate through doorways and down narrow corridors. That could be an important consideration for you if you intend to use your stroller for shopping trips or visits to the coffee shop or library. The side-by-side stroller is always much wider than the tandem stroller because the passengers must sit beside each other. Side-by-side strollers usually have average dimensions of 49” L x 32” W x 40” H.
The main drawback of side-by-side strollers is that they are difficult to maneuver through shop doorways and along narrow sidewalks. However, if you plan on only using your side-by-side stroller for walks through spacious parks or along broad, paved paths, that might not be an issue for you. If you like to get out and about in the car when going on day trips or visiting family and friends, you’ll benefit from a double stroller with travel system compatibility. Travel systems allow you to lift your child from the stroller into your car and vice versa without having to wake them. Most tandem strollers have one seat that will accommodate a child’s car seat. That kind of system will be perfect for parents with an infant and an older child. Some models accommodate a car seat with both seats, making this an ideal choice for parents with twins. Unfortunately, there are very few side-by-side strollers that can accommodate child car seats. That means you’ll need to transfer your children from the car seat to the stroller and vice versa, which can be time-consuming and something of a hassle, especially if you’re coping single-handed. Some models can accommodate child car seats in the front and back. Tandem strollers will fit through most shop doorways and along narrow sidewalks. Some tandem strollers have “stadium seating” that allows an older child to sit in the higher back seat, giving them a better view of the world. Tandem strollers typically come with snack trays, cup holders, canopies, underseat storage baskets, and handy pockets for your cell phone, keys, etc. Tandem strollers are typically longer than side-by-side strollers, so it’s difficult to access the child sitting in the front seat when you’re pushing the stroller. Many models of tandems don’t have rear seats that fully recline, making them unsuitable for a newborn, unless you buy a model that accommodates an infant car seat. Side-by-side strollers are designed for children of the same age, so they’re perfect for twins, particularly as this style of stroller works best when passengers of the same weight are riding. Side-by-side strollers are shallower than tandem strollers, so you have more control over the vehicle and better access to both your passengers. Side-by-side strollers can cause chaos when taken along busy sidewalks in town. And venturing out on narrow streets and crowded stores during hectic Christmas shopping periods is a definite no-no. If you have two toddlers, who tend to bicker, having them seated side-by-side can potentially be a nightmare. The range of side-by-side strollers that can be used with infant car seats is very limited. 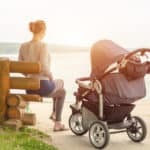 When it comes to choosing the right double stroller, you’ll first need to ask yourself where you want to take the stroller and what you want to use it for. Also, your choice will be influenced by the make-up of your family; do you have a baby and a toddler, or are you expecting twins? Modern double strollers of both styles are lighter and easier to maneuver than the older models, which could be cumbersome and bulky. However, tandem strollers are narrower than side-by-side strollers, and that could be important to you if you intend to use yours for shopping trips. 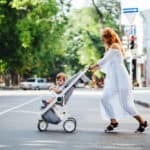 If your primary use for your stroller is going to be for walking or jogging in spacious areas, the width of the stroller won’t be an issue for you. Before you make a decision, take a look at some of the informative comparison articles on our site. 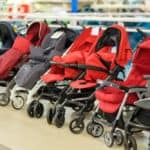 We compare many of today’s most popular makes of strollers of many different styles, saving you a lot of time and effort in researching them yourself.